Obituary for Octavia Joyce Jarrott | Larry Smith-Cooper Funeral Home, Inc.
Octavia Owens Jarrottbetter known as “Joyce” was born on October 14, 1945 the Fourth out of Thirteen children born to the late Mr. Davis “Boyd” Owens and Mrs. Edith Johnson Owens in Marion County. God saw fit to call our beloved Joyce home at her home on Saturday, March 30, 2019 surrounded by her loving and supportive family. Joycewas raised in Marion County. She attended the Public School System of Mullins, SC. Joycemade a remarkable career at the Marvel Lamp Lighting later renamed SLI from 1966-2010 upon her retirement. She took pride in being able to work on her first job for exactly 44 years. Joyce was raised in a loving and Christian environment. She attended the St. Paul Baptist Church Mullins, SC as a young adult. Upon marriage she joined the Hills Chapel Missionary Baptist Church Duford, SC. She later returned back to her home church St. Paul Baptist Church under the pastoral leadership of Rev. Dr. Henry E. Hardin. She continued her dedication to the church under the leadership of Rev. Dr. Mack T. Hines. 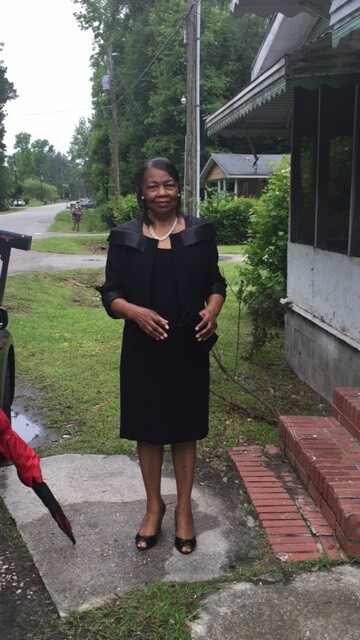 She served as member of the Senior Usher Board #2 as Vice President, member of the Pastor’s Aide, Senior Missionary Society, Sunday School Class #2, and the Mack T. Hines Bible Institute. For nearly 20 years she served effectively as Church Custodian until her health declined. Joycewas married to late Mr. John Odom Jarrott of Duford, SC. Joyce now rest with angels above she fought a good fight and kept the faith throughout her illness. She is preceded in death with her parents and 4 brothers; Milton, Willie (Buck), Davis (Jackie) and Ed Owens. Her memories and legacy will forever be cherished by her two daughters; Sandra McDuffie (Earl) of Sumter, SC and Diane Hemingway (Barry) of the Home. 3 Grandchildren; Ray McDuffie (Ashley) of Sumter, SC, Barry J. Hemingway “BJ” and Jalen K. Hemingway of the Home. 1 Step Granddaughter Shanique Hemingway of Florence, SC. 3 Great Grandchildren; Isaiah, David, and Kaliegh. 6 Sisters; Daisy B. Gerald, Barbara Johnson, and Vivian Owens all of Mullins, SC, Hazelteen Lee (James) of Marion, SC, Catherine Romer (Max) of New York, NY, and Altha McClellan (James) of Fork, SC. 2 brothers; Roy Owens (Vina Ruth) of Mullins, SC and Tony G. Owens ( Jannetta) of Fredericksburg, VA. Special Nieces; Gloria Jean Legette of Mullins, SC, Gloria Ann White of Fayetteville, NC, Tammy Gerald Ceo of Columbia, SC, Angel and Jamie McCllelean both of Fork, SC.. Special Nephews; Kewaski Bethea, James (Teresa) Gerald of Fort Campbell, KY, Vonel, Donel, and Moreece Teragene, and Leroy Owens. Sister in laws; Betty P. Owens of Mullins, SC, Brenda Owens of Marion, SC, Annie Jean Jarrott and Christine Jarrott both of Duford, SC, and Doris Ann Stanley of Baltimore, MD. A Special 1st Cousin;Mrs. Mattie Owens Ward of Mullins, SC. Adopted Grandchildren; Minister Laverne Page Jr. and Tomoroa Williamson. Sheleaves a wealth of Nieces, Nephews, and Cousins.